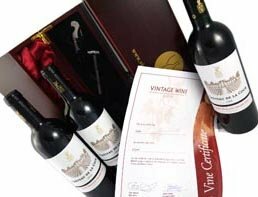 Welcome to vintagewinegifts.co.uk, the UK's largest Internet retailer of top quality Vintage Wine, Vintage Port, Whisky, Cognac, Armagnac and Vintage Champagne for anniversaries, birthdays, corporate gifts and other special occasions. Our minimum order quantity is just one bottle. We deliver BY APC COURIER direct, next day, to residential or business addresses anywhere in the UK. All orders are beautifully packaged in silk lined wooden boxes with a free gift card containing tasting and storage notes, and also your choice of gift message. Call us today on 020 8746 7771 to discuss any special requirements. We have the largest selection of 40th Anniversary wine gifts in the UK. All orders receive our new gift card free and if you spend over £30 per bottle and we'll include FREE wine accessories worth £17.99! Choose from our great selection of 1969 anniversary vintage wine gifts. We stock over 50 different bottles from 1994 which make the perfect 25th gift. Impressive range of wine and Vintage Port all from 1989 - the perfect 30th anniversary gift.